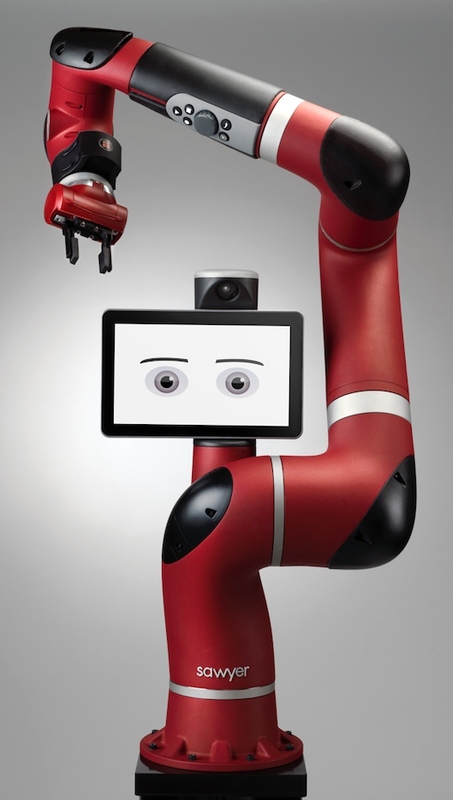 Meet Sawyer, the latest and greatest in smart, collaborative robots from Rethink Robotics. Sawyer has many things in common with Baxter, but there are also major differences. Sawyer is a single-arm, high-performance robot designed to execute machine tending, circuit board testing and other precise tasks that have historically been impractical to automate with traditional industrial robots. Sawyer is built around the same series elastic actuator technology used in Baxter, which keeps it inherently safe, but the actuators have been redesigned using titanium “S” springs. Sawyer’s casing has also been changed, high performance Aluminium has replaced the plastic casing found on Baxter. These innovative design changes allows Sawyer’s arm to be considerably smaller than Baxter. Rodney Brooks said the arm’s seven degrees of freedom and 1-metre reach open up new a whole range of applications that Baxter is just not designed for. “The arm can just snake right in there,” he said. With the advancement of technology in Sawyer it will be priced at $29,000 (around £25,000 at time of release) which is still cheaper than many products on the market and keeps ROI in less than 12 months. With rising labour costs around the world, particularly in the Far East, manufacturers are increasing looking for other ways to reduce production costs. Smart, collaborative robots like Sawyer and Baxter can provide businesses with a low cost, flexible solution which can provide ROI in less that 12 months! 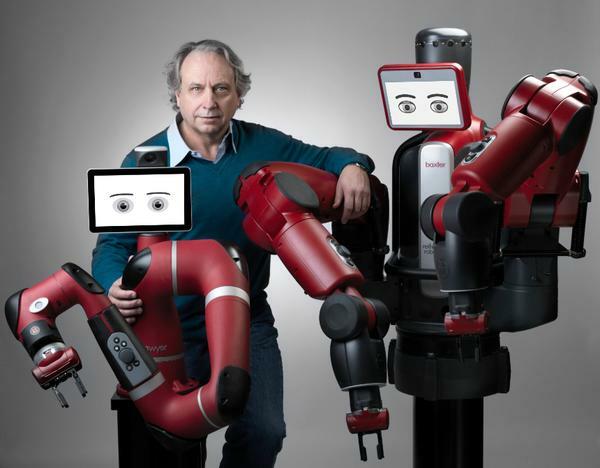 Baxter has proved the concept of smart, collaborative robot manufacturing within the US and now Sawyer will take this concept Worldwide. Offshoring has long been a headache for businesses and an ever increasing worry for workers who fear the their jobs are going to lost to cheap overseas labour. Through utilising low cost collaborative robotic solutions manufacturing can be kept domestically and a trend of reshoring can commence. Rethink Robotics have taken valuable lessons from Baxter and listened to early adopters to reduce the size of Sawyer to fit into a 2 x 2 x 5 foot area. This kind of area represents the standard space for a human on a tightly packed assembly line, which was something Baxter just couldn’t do! 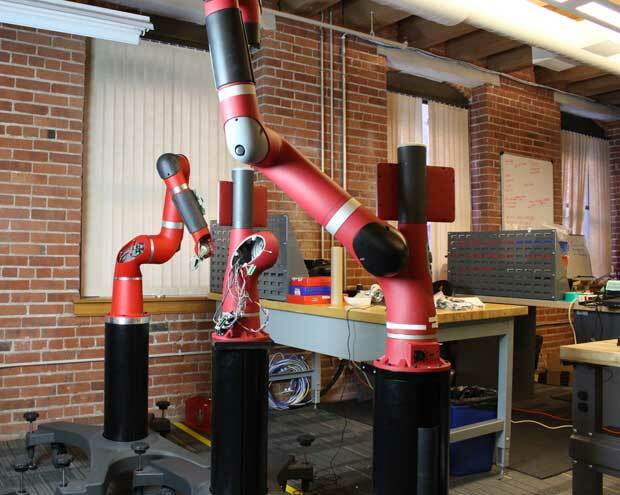 Photo: Rethink Robotics – Sawyer robots being assembled at Rethink Robotics’ headquarters in Boston, Massachusetts. Sawyer has a limited number of sensors; in talking with clients about potential applications, Rethink decided to focus on what would be most useful. The biggest upgrade is the wrist camera, which is now a Cognex with a built-in light source, repositioned so that it won’t be occluded by large grippers. Other than that, there’s just one more camera on Sawyer’s head, and of course all of the series elastic actuators can sense forces very accurately. This allows the robot to do more delicate tasks, and also maintain the level of intrinsic safety that made Baxter a robot that humans could work around, even if it accidentally hits them. Sawyer runs Rethink’s ROS-based software platform Intera and also features the same interactive control system as Baxter, with just a few tweaks to the interface. You can still teach the robot to do simple tasks just by grabbing it by the wrist and showing it once, and it’ll adapt to minor changes in its environment without any additional input. Rethink have “signed contracts for hundreds of robots” already within the USA, the first International units are expected to ship by the end of 2015.